Note: You say ついつい ( = tsui tsui) when you emphasize your feelings. It is often used with Vてしまう ( = te shimau) / (casual form ) ちゃう ( = chau). = Shukudai wo yatte shimau. You also use this form when you do things unintentionally. = Kanojo wo nakasete shimatta. = I made her cry. By adding つい ( = tsui ) you can add the nuance of “by accident” / “without control” more. = Tsui, kanojo wo nakasete shimatta. When you compare Ex. A) and B), the sentence with つい ( = tsui) (B) emphasizes the fact that the writer /speaker had not intended to make her cry but ended up making her cry. It often expresses one’s regret feelings. = Densha no naka de tsui inemuri shite shimai hitoeki, norisugoshite shimatta. = (I shouldn’t have fall asleep but) I fell asleep on the train and passed my stop by one station. = Kanojo no mae de tsui hoka no onnano ko ga kawaii tte icchatta. = (I shouldn’t have said anything but) I told my girlfriend that some other girl is cute without thinking. = Tsui kuchi ga subette Nakamura-kun no koto ga suki datte tomodachi ni icchatta. = I accidentally told my friends that I have feelings for Nakamura-kun. = Geemu ni tsui muchuu ni narisugite , shukudai ga dekinakatta. = I got so into the game, I ended up not doing my homework. = Kare no kao ni wo mite tsui waratte shimatta. = When I saw his face, I couldn’t help laughing. = Kono mise no ryouri wa oishii kara tsuitsui tabesugi chatta. = The food at this restaurant is so good that I ended up eating too much. つい ( = tsui) and うっかり ( = ukkari) both mean “carelessly” but you often use them both. = Okyaku san ni tsui ukkari otsuri wo ooku watashi sugite shimatta. = I accidentally gave a customer too much change. = Kaigichuu ni, tsui ukkari hougen ga dete shimatta. = I accidentally talked in dialect* in the meeting. = Doushite watashi no oyatsu wo tabechatta no? = Why did you eat my snack? = I couldn’t help it…. *Even though you knew you shouldn’t do something, you couldn’t control yourself and did it anyway. = Ashita wa, asa hayaku okinakereba ikenai noni tsui osoku made terebi wo mite shimatta. = Even though I knew I had to get up early tomorrow morning, I ended up staying up late and watching TV. = Kare wa taipu janai noni tsui LINE wo koukan shite shimatta. = Even though he wasn’t my type, I ended up exchanged LINE contacts with him. = Tsukarete ita node tsui otto ni atatte shimatta. = I was so tired that I couldn’t help taking out on my husband. = Kyuuryou ga hairu to tsui hito ni ogoritaku naru. = Whenever I get paid, I can’t help treating people. = Tomodachi to hanashite ite mo tsui sumaho wo mite shimau. = Even when I am with my friend, I can’t help looking at my smartphone. = Osake wa yameyou to omotte iru noni tsuitsui nonde shimau. = Although I made up my mind to quit drinking, I ended up drinking. = Ikemen ga tooru to tsui michau. = Whenever I pass by a cute guy, I can’t help looking at him. = Mago ga kuru to tsuitsui okodukai wo agete shimau. = Whenever my grandchildren come over, I can’t help giving them pocket money. = Kawaii ko wo mae ni suru to tsui kakkou wo tsukete shimau. = When I am with a cute girl, I can’t help but trying to act cool. = Nomikai de, tsui hashagisugite ato kara hansei suru koto ga ooi. = I often go too crazy at drinking parties and regret it later. = Sabishiku naru to tsuitsui amai mono wo tabete shimau. = When I feel lonely, I can’t help eating sweets. = Donnani kare no koto wo okotte ite mo ano egao wo miru to tsui yurushite shimau. = No matter how angry I am with him, I can’t help but forgive him when I see his smile. = Mukashi no hanashi wo shite iru to hanashi ga tsuitsui nagaku naru. = When I talk about the old days, I tend to talk too long. = Himada to tsuitsui moto kare no feesubukku wo mite shimau. = Whenever I get a free time, I can’t help checking my ex-boyfriend’s facebook page. Note: The Japanese sentence doesn’t have actually have the word “again” in it, but from this sentence it’s apparent I’m in the habit of lying. You often use つい ( = tsui) with がち ( = gachi) when you talk about the tendency. = Isogashii to tsui ryouri mo te wo nukigachi ni naru. = When I am busy, I tend to slack off cooking. = Barentain wa tsui takai choko wo kai gachi da. = Tsui sakki, Ken-kun ga kireina onna no ko to aruite ita no wo mikaketa yo. = I just saw Ken-kun walking a cute girl. = Tsui konoaida made kono michi wa kouji chuu datta. = Until just recently this street was under construction. = Tsui senjitsu, Hokkaidou ni itte kimashita. = I was in Hokkaido just the other day. = Tsui sengetsu, nihon kara kaetta bakari desu. = I just came back from Japan last month. = Tsui imashigata okusama kara odenwa ga arimashita. = You just got a phone call from your wife. = Cookie, uso wo tsuku to sugu ni bero ga deru kara barebare dayo. = Cookie, it is too obvious when you lie because you stick your tongue out. Just started Patreon to keep our site. I am working on a translation project for my friends and I just discovered your website. It is so very helpful! There are so many little parts of speaking a language that they don’t teach you in school, so it’s easy to become lost when you’re reading “real”, informal text. Your explanations have saved me several times. I am learning so much! Thank you for the time and effort you have put into making these lessons. Thank you for your comment. I am so happy to hear you are learning real Japanese from this site. Haha I can’t just teach you all the JLPT N3 grammar and kanji in the comment section. You should get textbooks and ask me question if you have some doubt in Maggie’s Room. My site is not to study JLPT test but I just classified some of my grammar lesson by its JLPT level. If you click the tag, JLPT N3, you can see those lessons. There are many good site out there just to teach JLPT Japanese. Google with “JLPT N3 kanji list”. If I say….I tried my level best.. I guess that is possible but what kind of prediction came true? Hi sensei .genki desu ka??. ということだand とのことだ。。。how we will use it ?? I’ve been going through your lessons for quite a while now and its been very helpful! Easy to understand and very detailed! つい is an adverb and it modifies a verb and it is pretty flexible. So basically つい can go anywhere and not change the meaning of the sentence? Like these 3 sentences = different position of つい does not affect the meaning? Right the meaning is the same. As I wrote in the note, if you start the sentence with つい, the listener can tell the speaker did something without intention right away. 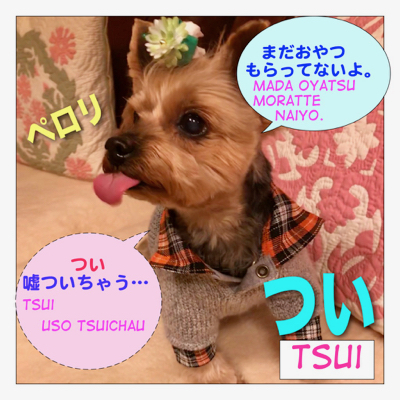 Hi Check my こそあど言葉 lesson. I explained everything. Like my frnd predicted that I will be passed….so I replied your prediction became true .?? OK, in that case, 予測が真実になった might sound a bit too serious. 友達の予想通りになった。= Tomodachi no yosou doori ni natta. 友達の言った通りになった。= Tomodachi no itta toori ni natta. Hello teacher..how are you…..1 of July jlpt 4 exam is going to held in delhi…..I am preparing very hard…so if you have any important kanji or grammar or suggestions…plz let me know….I learnt lots of things from….for that thank u very much…..
Did you try the sample test? At this point, you can set the time and do the sample exam and see how you do it. がんばって！　You can do it! Hello sensei….how are you?? How can we say .that I was plucking the flowers??? I’m good! How have you been? You say 花を摘んでいました／摘んでいた = Hana wo tsunde imashita/tsunde ita. Good morning teacher…..How are you..
簡単(kantan) and 易しい ( yasashii) ? Now 簡単 and 易しい both mean “easy” and sometime they are interchangeable. = The test was easy. = I will make something simple. If you say 易しいものを作ります it means I will make something easy to make. and you are talking about the procedure of cooking is easy. I would rather stay single than live with someone I can’t get along. 助ける ( = たすける = tasukeru ) and 手伝う ( = てつだう = tetsudau) are both translated “help” but while “tetsudau” is to give a hand and something minor and 助ける ( = tasukeru ) is for something more serious. Thank you sensei you answer is very understandable….you should be a proffecer of japnese language…..
Good morning teacher….How are you ….what is the best way to remember kanji. Do you have any kanji book? Three or five kanji per day and test yourself on the weekend. Try not to remember many kanji at a time. It’s overwhelming. = Naze/ Doushite tabenai no desu ka? = Why don’t you eat? = (Kore wa) Douyatte taberu no desu ka? = How do I eat (this)? Thank you.teacher..and I am preparing for jlpt 4 ….and how i improve my communication in japnese..
As for communication, do you have any Japanese friends? I have been thinking of making a new lesson because it is complicated. Basically If you make someone do something for you, you use a causative form. = ( Watashi wa) Tomodachi ni asagohan wo tsukuraseru./ tsukurasemasu. I am working on “ba” lesson but check out my たら・と&ないと lesson first. I gave lots of example sentences there. You can find all my lesson through Index. And as I told you, I haven’t made a lesson on ば yet. 整理する= せいりする= seiri suru = to organize something, to put something in order. 考えを整理する= かんがえをせいりする= kangae wo seiri suru = organize one’s thoughts. Good morning teacher..no.i don’t have 😟😟😟😟. OK, I can’t give you any examples here but I believe there are some sites or apps that you can practice your Japanese with Japanese people. You can go through the Index page and choose the topics you like. And I will keep making more and more lessons for everybody! It depends on kanji. Kaeru has many different kanji. = A to B wo kaete kudasai/ torikaete kudasai. = Please exchange A with B. You can say “All the best to you” in many ways. = Mada V(suru) / noun+ の junbi ga dekite imasen. You mean “to lose fat”? = Shibou wo herasu tame ni kaidan wo / no nobori ori shiteimasu. “for me”: It depends on the verb or context but “watashi no tameni” may work for many situations. There are cases that they are interchangeable. When you made some decision. = I decided to go to Japan. Hi sensei do you use watts app???? Wow your father in law is a tour guide? Then you can learn a lot from him,too. I’m sure Indian people are really nice!! Hi sensei how are you…..opration nihongo de nan desu ka….I mean how to say…I had opration due to problem….oshiete itadakemasen ka. Thank u sensei..he is working from 25 years as a japnese tour guide he knows all prefecture nihongo….even all the history of India and Japan as well….and he studied by himself without any help just books nd all…. Wow! Then you can do it,too!! Yes, I live in Japan. = Especially Maggie is beautiful. (Nihon no tabemono wa minna suki desu ga) toku ni sushi ga suki desu. (I love all the Japanese food but )I especially like sushi. = Kyou wa tokubetsu na hi desu. = It is a special day today. * 働く = はたらく = hataraku = means “to work” in general. * 勤める = つとめる = tsutomeru = means you are hired by a company/bank/store/restauran,etc. and you work for them. = Kyou wa yoku hatarakimashita. = I worked a lot today. = Kyou wa yoku tsutomemashita. = ABC gaisha de hataraite imasu. = ABC gaisha ni tsutomete imasu. The usage of がたい is more limited. You use with non-action verbs. Thank you sensei..for your answer…..you always made things very clear thank u…..sensei what is the diffrance between ukagaimasu and mairimasu?? You can use both when you go visit who you respect/someone superior. I will visit you six. When you simply go somewhere, you can use “mairu” you can’t use 伺う (=ukagau) unless you visit someone superior. = Kore kara Tokyou ni nmairimasu. = I will go to Tokyo now. = Kore kara Tokyo ni ukagaimasu. Hai, genki desu. Saurabh mo genki desu ka? = Isha ni itte me wo miseta. I went to the doctor and had them/him/her examine my eyes. = Isha ni itte me wo mite moratta.